Life can be pretty hectic at times, and there are moments when you might actually be so caught up in your work, so much so that you would have forgotten all about feeding your pet at home. That is just grossly irresponsible, so you might want to enlist the help of technology to get the job done on your behalf. Just in case you know that this will be a very busy week, perhaps you might want to invest in a pet feeder like the $29.99 Jumbl Filtered Pet Fountain Feeder. This is no ordinary pet fountain feeder, as it comes with its own removable food bowl as well as integrated night light for additional safety. 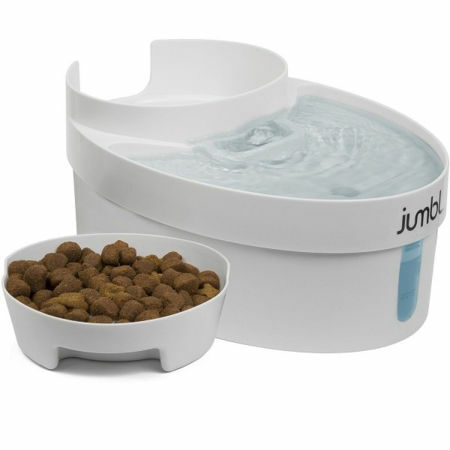 This 3-in-1 pet fountain from Jumbl can be said to be an innovative dispensary of both, and it is perfectly suitable for pet owners who need to leave for the day or a longer event. It is comprised of up to three pieces: a reservoir base that holds up to three liters of water, a fountain pump that’s attached to a water serving dish, and a removable food bowl that holds 3.4 cups of pet food. The pump will work non-stop to cycle the water from the reservoir up to the water servings dish, and let the remaining water run back into the reservoir. It works in a quiet and efficient manner, and will play nice with any standard wall outlet. Very cool … I’ll have to get it for my dog!